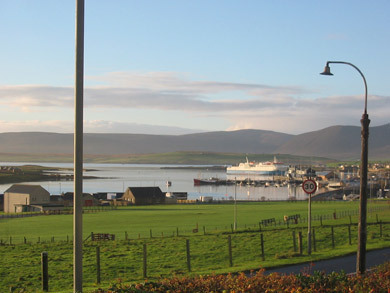 Heres a picture taken from my front yard last week in Stromness, at exactly 9am, on Oct 23rd, 2004 AD, a moment that some would call significant. The photo was uploaded here on Flicker using a free beta client for Mac called 1001. The software is great. It streams recent photos from my Flickr account onto my desktop – photos from my friends, that is. a little better than your view in Walthamstow? so, any plans to bring in the timothy’s yet? i smiled when i read that yesterday. i can’t wait to see what god is going to do there with you andrew! I am unfaithful – I have not followed your pilgrimage in the last 2 weeks or so. Sorry for all the hazzle – but I will suggest you for championship in the next survivalist conference. Thx God for bringing them (to a new) home! Beautiful! So you are only a 6 hour ferry ride from Aberdeen? May I come to visit you when I come to Aberdeen in May 05? Grace and Peace to you in this new adventure. Amazing view. God is good!